Last weekend on a snowy Sunday in the suburbs of Boston, 43 athletes played squash to support two South African organizations: Education Africa & Egoli Squash. Our USA-based organization teamed up with Cross Courts Squash, an athletic club 30 minutes outside of Boston, Massachusetts, to hold a benefit tournament for these two great causes. In just 5 hours, the Cross Courts community raised almost $3,400 to support South African youth! Why squash and education? Why South Africa? 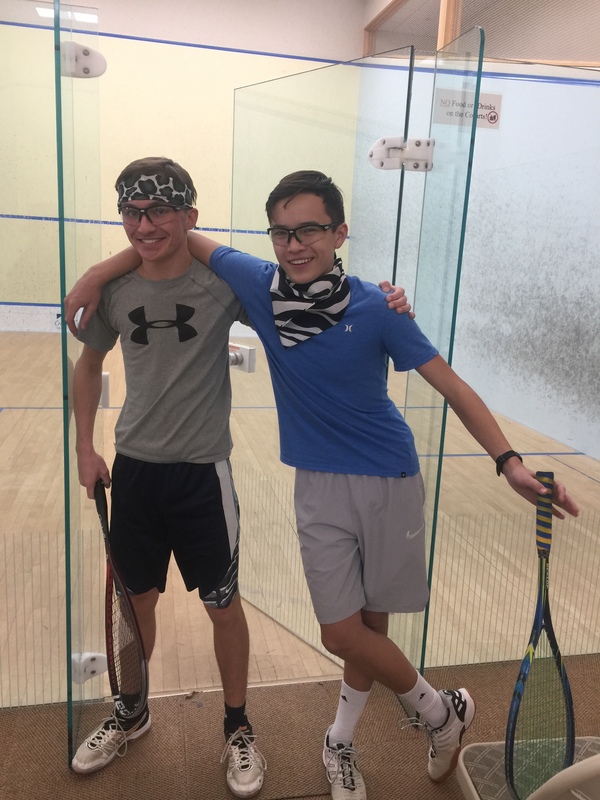 Joey Roberts, the head squash professional at Cross Courts, deeply understands the benefits of squash and education in a young person’s life. As a young athlete in Belfast, Ireland, he learned the rewards of hard work by playing squash and earning a scholarship to Yale University. Mike Tootill, Joey Roberts & Geoff Moorhead. Mike Tootill, a squash professional and coach at Cross Courts, also knows the power of squash to provide opportunities. As a South African himself, Mike has represented South Africa for squash for many years, earning numerous titles and serving as a volunteer for Egoli Squash, an all volunteer program in Johannesburg that helps disadvantaged youth succeed through squash. Both of these professionals are now coaches that mentor young squash players, both on and off the court. They decided to give their time and effort to planning this tournament for us and Egoli Squash to teach their community about the challenges facing South Africa, and how both sport and education provide essential solutions for uplifting our youth. The tournament was a huge success! There were 43 participants and four brackets. Each winner took home a prize, and all players were given safari-themed bandanas and t-shirts to celebrate the day. Importantly, Cross Courts invited six athletes from SquashBusters, a local urban squash program, to participate in the tournament. At Education Africa, we believe that the success of our youth will depend on every child finding their own passion and having the opportunity to pursue that. Whether it be music, debate, cooking, dance, or squash, we are excited to have partners across the world who also believe in our vision. Thank you to everyone who donated and participated! We cannot do the work we do without you all! You have helped give hope and opportunity to the most disadvantaged children in South Africa.